What will the Iran deal mean for judgment creditors? In a 6-2 decision released today, authored by Justice Ruth Bader Ginsburg, the U.S. Supreme Court affirmed lower court rulings that awarded nearly $2 billion in frozen Iranian government assets to victims of terrorism. The money, frozen in 2008 in New York accounts controlled by Clearstream Banking S.A. of Luxembourg, ultimately belonged to Bank Markazi Iran, the Central Bank of Iran. The chain of ownership was somewhat complicated. As part of its foreign currency reserves, Bank Markazi held $1.75 billion in security entitlements in foreign government and supranational bonds at Banca UBAE S.p.A., an Italian bank. App., infra, 2a; C.A. App. 1329-1332, 1779. UBAE, in turn, held corresponding security entitlements in an account with another intermediary, Clearstream Banking, S.A., in Luxembourg. App., infra, 2a,57a-59a. Clearstream then held corresponding security entitlements in an omnibus account at Citibank, N.A., in New York. Id. at 2a. At issue at the Supreme Court was not this chain of ownership, which the lower courts affirmed, but simply whether Congress had overstepped its bounds in singling out the case in a provision of the Iran Threat Reduction and Syria Human Rights Act of 2012, 22 U.S.C. §8772 intended to facilitate the collection of these assets on behalf of the 16 groups of terror victim plaintiffs. In her Opinion, Justice Ginsberg found that Section 8772 was not a “one-case-only regime,” that applied to just one case and just one asset. Rather, it covers a category of postjudgment execution claims filed by numerous plaintiffs who, in multiple civil actions, obtained evidence-based judgments against Iran together amounting to billions of dollars. Section 8772 subjects the designated assets to execution “to satisfy any judgment” against Iran for damages caused by specified acts of terrorism. §8772(a)(1) (emphasis added). In a landmark victory after years of litigation, U.S. victims of Iranian state-sponsored terror attacks have won the right to collect $9.4 million from a long-frozen asset in California belonging to the Iranian regime. The case, known as Ministry of Defense v. Frym, involves several groups of plaintiffs, including the daughter of former Iranian Prime Minister Shahpour Bakhtiar, who was murdered by an Iranian hit team in his residence in France in 1991, and the Rubin plaintiffs, who sued Iran following a 1997 suicide bombing in Jerusalem. The case is also being viewed as a potential shot at Obama administration efforts to rebuild diplomatic ties with Tehran. The administration has given Iran more than $150 billion in economic sanctions relief despite efforts by U.S. lawmakers to block the release until Iran pays U.S. victims of terrorism. The $9.4 million stems from a pre-revolution contract between the Iranian Defense Ministry and Cubic Systems in California. I first identified the Cubic Systems contract on behalf of another group of plaintiffs in 1997, but they and other subsequent claimants lost their turnover cases on appeal. Since those cases, the federal laws governing foreign sovereign immunity and the ability of terror victims to sue state sponsors of terrorism have been strengthened significantly in favor of the victims. the Algiers Accords, by which the United States and Iran resolved the Iranian Hostage Crisis, did not prevent the lien claimants from attaching the Cubic Judgment. The Free Beacon has posted the full decision here. The House split along party lines on Thursday to pass HR 3457, the Justice for Victims of Iranian Terrorism Act, with just 10 Democrats joining 241 Republicans and five members from each party not voting. New York Democrat Eliot Engel, the ranking member of the House Foreign Affairs committee, regretted the partisan nature of the bill, which he and others saw as an effort to revote on the Iran nuclear agreement. “We should be passing legislation which I know we can get out of the Foreign Affairs Committee in a collaborative way that would really do something to help these victims. That would really do something to hold Iran accountable for all its reprehensible acts,” Engel said on the floor today. Several members cited family members of victims of Iranian terror attacks they had met with recently, including the widow of Chief Warrant officer Kenneth Welch, who died during a truck-bomb attack on the U.S. embassy annex in Beirut on Sept. 20, 1984; former U.S. Navy Seal Ken Stethem, brother of U.S. Navy diver Robbie Stethem, who was murdered on board TWA 847 in Beirut by Imad Mugniyeh in 1985, and Anne Dammarell, a U.S. AID worker who was injured during the bombing on the U.S. Embassy in Beirut on April 18, 1983. In response to criticism from Democrats that Iran doesn’t have $45 billion in cash to pay the terror claims, the bill’s sponsor, Pennsylvania Republican Pat Meehan, reminded Members that Iran had just found $21 billion to buy new fighter jets from Russia. The Senate will now take up a companion bill, S.2086, sponsored by Republican Senator Pat Toomey of Pennsylvania. The White House has maintained its threat to veto the legislation. The House is expected to vote tomorrow, Oct. 1, on a bill that would require the Islamic Republic of Iran to pay an estimated $43 billion to victims of terrorism before the U.S. government would unfreeze Iranian government assets under the Joint Comprehensive Plan of Action (JCPOA), otherwise known as the Iran nuclear deal. The bill, the Justice for Victims of Iranian Terrorism Act, was incorporated into the National Defense authorization Act for 2016. In presenting the bill on the floor of the House, Pennsylvania Republican Patrick Meehan released a video highlighting U.S. Navy diver Robbie Stethem and other Iranian victims. “We’re putting our victims to the side if we enable these dollars to be returned to Iran without any attachment to them,” Meehan said. Meehan has proposed the Twitter hashtag #NotOneCent for his effort. Senators Pat Toomey (R, Pa) andMark Kirk (R, Ill) introduced companion legislation in the Senate today, S2086. “Families of Americans killed by Iranian-backed terrorism have used U.S. laws to take Iran to court and lawfully win approximately $43.5 billion in unsatisfied damages, so if the United States fails to ensure Iran fully pays these judgments before Iranian terror financiers get over $100 billion in sanctions relief, we risk emboldening Iran and other state sponsors of terror to continue targeting and killing more Americans,” Kirk said. Complete text of the Meehan bill, H.R. 3457, is here. The Office of Management and Budget today issued a statement that it “strongly opposes” making Iran pay the terrorism claims, arguing that “obstructing implementation of the JCPOA would greatly undermine our national security interests. President Obama will veto the bill if it makes it through to his desk, the OMB promised. At first blush, there’s nothing in the Iran deal that specifically relates to the scores of judgments against the Islamic Republic of Iran for its terrorist actions. Nor were there any leaks during the negotiation process that this was a subject of discussion. However, after taking a deeper dive into the text of the agreement, a few troubling hints emerge. First is the inclusion of Assa Corp and Assa Corp Ltd in Attachment 3, the list of individuals and entities scheduled for immediate sanction relief on “Implementation Day” (roughly 2-6 months from now). Does that mean the 40% share in the 650 Fifth Avenue property owned by Assa Corp beneficially for Bank Melli, and currently the subject of federal foreiture proceedings, will be unblocked and released to Assa Corp and transferred back to Iran? If the law is any measure, probably not. But as Secretary Kerry pointed out in presenting this agreement, we are entering a world of new policies. For example, in several places the agreement commits the United States government to intervening not only with Congress to repeal a broad array of sanctions laws, but also with state and local governments that have passed divestment laws. The agreement calls for the normalization of trade and economic relations with Iran, and spells out in great detail how and when specific sanctions will be lifted and specific laws mooted through presidential waivers pending legislative repeal. Will Iran make a case, as allowed under the JCPOA, that monetary judgments against it under the Foreign Sovereign Immunity Act and/or TRIA “adversely affect the normalization of trade and economic relations?” If so, the agreement gives them the possibility of convening the Joint Commission, where Iran sits along with Russia and China, to seek to impose their will on the United States. This could spell big potential trouble for judgment creditors. The Senate Foreign Relations Committee is finalizing legislation that would compensate U.S. diplomats taken hostage in 1979 and their families, using money paid in fines and forfeiture to the US government from businesses that have violated U.S. sanctions on Iran. Under the agreement, surviving hostages would receive about $3 million each, and their spouses $600,000, under a deal brokered with the State Department by Georgia Republican Senator Johnny Isakson and Maryland Democrat Senator Ben Cardin. The U.S. diplomats taken hostage by revolutionary “students” loyal to Ayatollah Khomeini have faced a legal barrier that has prevented them from getting a judgment against the Iranian regime in U.S. courts. The U.S. agreement with Iran that led to the captives’ 1981 release, known as the Algiers Accords, prohibits the former hostages from seeking damages from Iran. Against that backdrop, they have lost their court battles, as administrations under different presidents have stood by the terms of that agreement. The Department of Justice announced last month that it would set aside a portion of the $15.5 billion in sanctions violation fines, penalties and forfeited assets paid by banks, to compensate individuals who have been “harmed” by the actions of Iran, Sudan, and Cuba. These three are the last remaining state sponsors of international terrorism. In information released in May, DoJ said their first priority would be to compensate individuals “harmed” by the state sponsors between 2004-2012, roughly the period of the sanctions violations committed by the banks assessed with the largest penalties. But they held the door open to victims of state actions that occurred before or after those years. Last week’s bipartisan agreement at the Senate Foreign Relations committee appears to be aimed at pushing the DoJ to open the window wider. Will U.S. use BNP Paribas settlement to compensate terror victims? That’s the key question that came out of Friday’s court hearing in New York, where BNP Paribas was formally sentenced to forfeit $8.9 billion to the feds. The U.S. government announced a system Friday to compensate people harmed by Sudan, Iran and Cuba using some of the $8.9 billion forfeited by France’s largest bank for violating U.S. economic sanctions by processing transactions for clients in blacklisted countries. Assistant U.S. Attorney Andrew Goldstein revealed the plan after U.S. District Judge Lorna G. Schofield formally sentenced BNP Paribas consistent with the bank’s guilty plea last year. She said the bank must turn over the forfeiture and pay a $140 million fine. It also pleaded guilty to state charges. But any of the money actually reach terror victims? New York Mayor Bill de Blasio noted in a release that $448 million of the BNP forfeiture will go to the Manhattan district attorney’s office and $447 million to the city, some of which will be used to equip all police officers with smartphones. And for more than a dozen victims of the 1998 U.S. embassy bombings in Africa who showed up in court, the announcement that the feds wanted them to file a claim on the funds at http://usvbnpp.com was a let down. This is the new blog of the Fleming Timmerman Law Group, pllc. We are located in Washington, DC and have been working to help victims of Iranian regime state-sponsored terrorism for the past 18 years. Ken Timmerman began working to identify Islamic regime assets on behalf of victims of terrorism in 1997. 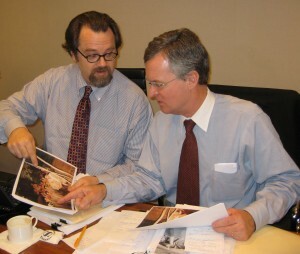 Tim Fleming joined a consortium of lawyers representing victims of the 9/11 attacks in 2003. In the picture above, Ken is on the right and Tim is on the left. That’s how we are in real life, as well – a political odd-couple in the fight for justice on behalf of the victims of the Islamic Republic of Iran.